Good design can set you apart from competitors, especially when you're applying for a job. Interviews are all about first impressions. In a short window of time, you're expected to put your best foot forward and prove to the person behind the desk that you're the best candidate for the job. You've probably put a lot of thought into what you're wearing, you've rehearsed common interview questions in your head over and over again, you've researched the company and have questions at the ready. You may have even fine-tuned the content of your resume. But how much thought did you put into the design of your resume? According to studies, hiring recruiters only look at an individual resume between 6-15 seconds. 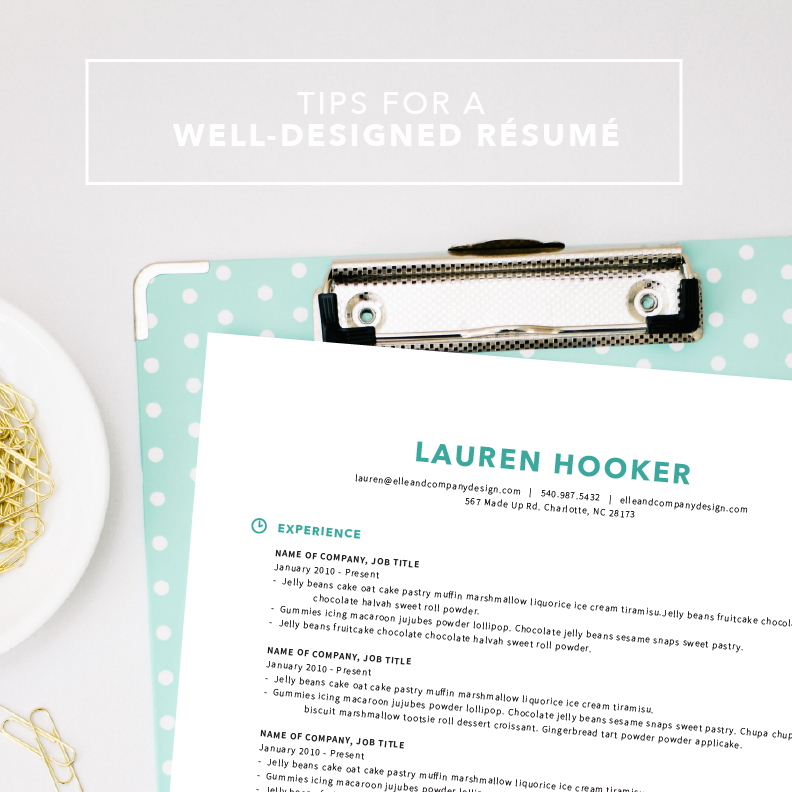 A well-organized, visually pleasing resume is a great way to make a strong first impression. Everyone appreciates good design, including your interviewer. The good news is that you don't have to be a graphic designer to have a well-designed resume. Here are some easy tips to help your resume stand apart from the rest! Disregard the silly filler text. This post is about resume design. Resume content is a whole different blog post! There are two categories for fonts: serif and sans-serif. Times New Roman and Cambria are serif fonts; they have a small line on the end of each point in a letter. Arial and Calibri are sans-serif fonts; they are usually rounder and do not contain serifs (like the font for this blog post). Why is this important? Serif fonts look fine at larger point sizes, but as you reduce the size, they become harder to read. Serifs are not good to use in the body text of your resume. Use a sans-serif instead to attract a reader's eye to the content. It's also wise to abstain from using several different fonts when designing your resume. The more fonts you use, the more cluttered it will become. You want the design to add to your resume, not distract an interviewer from the important information on the page. As a rule of thumb, use no more than two fonts - one for headers, one for body text. Spacing is an important visual cue, as well as a resting place for the eyes. It separates sections, creates hierarchy, and directs our eyes around the page. Keep the header and its content grouped together. Anyone should be able to glance at a section header and understand it belongs with the bullets below. Don't use uniform spacing throughout the entire document. Instead, create visual hierarchy by using less space between section title and content and more space between individual sections. Use discernment on how much content you're adding to your resume. Remember when I said that too many fonts can make your resume look cluttered? Too much information can make your resume look cluttered, too. While I'm no expert in telling you which details you should include on the document, I can tell you that cramming as much text as possible onto a page is never visually appealing. The point of your resume is to give your interviewer a brief overview of your qualifications and experience. If the average time an hiring recruiter spends looking at a resume is 5-16 seconds, chances are that they will glaze right over large chunks of text because they don't stand out. Catch their eye by listing your accomplishments in bullet points. After putting so much effort into the design of your resume, the last thing you want to do is print it out on thin, boring copy paper. Help your resume stand out from other interviewees by using heavier stock paper (personally, I love the texture and quality of linen paper). Good materials are just as important as the designs themselves. If you're going to put time and effort into your appearance for an interview, shouldn't you invest some time into the appearance of your resume? Depending on the position you're applying for, your interviewer may even see your resume before they have the chance to meet you. It's important that your resume is a good reflection of who you are, both in content and design. Are you an Elle & Company Library member? Subscribe today!